I finally got my hands on some more of the old Citadel plastic cavalry. They were painted, and in slightly rough shape. But definitely something I can work with. The minis below were partially disassembled, reassembled, added banners, and repainted. 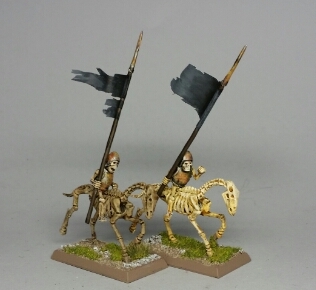 When playing KoW recently, I learned how awful undead standard bearers on foot are. They just can't keep up with the rest of the army. So next time I will try mounted standard bearers. Alternately, they can just go in regular units of cavalry. In fact, I can add these to my previous 8 re-paints for a nice, round unit of 10. What..? Standard bearers in KoW are not part of units?? They can be, but there is no game effect or rule for them. There are rules for army standards as individuals, though.